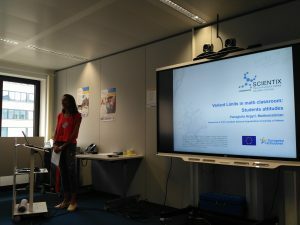 She then presented these teaching scenarios, along with the conclusions from their implementation, in a training seminar organized by the European Schoolnet on 12 September 2018 in Brussels, Belgium. You can see here the training seminar programme and Ms. Argyri’s presentation. This training seminar was followed by a Tweet Chat entitled «Educational games development: what challenges and perspectives?» on the 19th September 2018 at 17:00 (CET). 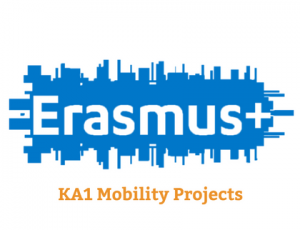 You can find attached screen shots of the chat refering to the afore mentioned teaching scenarios and to the relevant in-service training seminar she attended within the framework of this Erasmus+KA1 project. 3. Mrs. Eirini Arnaouti, in collaboration with Mrs. Chrysi Aggelidou, realized a cross-curricular project entitled «Creation of Board Games about Biochemistry themes in the English Language» in the framework of the subjects of «Biology» and «English» in the B’ Class in Evangeliki Model High School of Smyrna during the spring semester of the school year 2017-2018. You can see the students’ creations of the Creative and Cross-curricular projects here. 5. 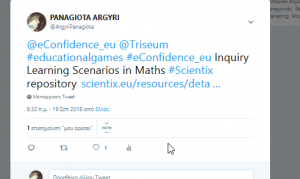 Ms. Panagiota Argyri made posts on the STEM Discovery Week 2018 blog regarding this training seminar before leaving (see here) and after returning and implementing game-based learning in her teaching practice (see here). Furthermore, she realised two relevant webinars; the first one entitled «It’s a game changer!» on Scientix portal (see here) and the second one entitled «Game-based learning in the classroom research: validating Variant: Limits™» on Future Classroom Lab portal. 6. Mrs. Eirini Arnaouti, in collaboration with Mrs. Chrysi Aggelidou, ex-Chemistry teacher of our school, made a presentation entitled «Creation of Board Games with Biochemistry themes in the English Language» about the implementation of game-based learning principles in the 4th International Conference for the Promotion of Educational Innovation, held in Larissa, Greece, on 12-14 October 2018. You can find attached the conference programme and the presentation PowerPoint in Greek. The presentation paper was published in Greek in the conference proceedings (Aggelidou, C. & Arnaouti, Ε. (13 October 2018). Presentation entitled “Making Board Games on Biochemistry in the English Language” in the 4th International Conference for the Promotion of Educational Innovation, Larissa, Greece, 12-14 October 2018, Vol. D’, pp. 32-36).